Larry Greenfield is a fellow of the Claremont Institute for the Study of Statesmanship & Political Philosophy. His articles have appeared at American Greatness, American Thinker, PJ Media, Flashreport, and Investors Business Daily. He also writes regularly for the Jewish Journal. Larry earned his BA at UC Berkeley, and his JD at the Georgetown University Law Center. 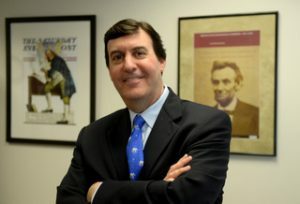 He was the founding executive director of the Reagan Legacy Foundation and he has consulted senior members of Congress on public policy issues. Mr. Greenfield served in the Armed Forces of the United States in Naval Intelligence Reserves and was the publisher of the Journal of International Security Affairs. We are delighted that Mr. Greenfield will join our Advisory Council. His depth and breadth of knowledge in areas relevant to AFA, plus his long-time association with the organization, have proven invaluable to us and we’re looking forward to continued benefit from his wisdom, knowledge and counsel.